Here’s a music video I found about the Toronto Maple Leafs. I didn’t want to post it since its making fun of the Leafs, but you have to be able to take a joke in hockey. The girl is a horrible singer but it is funny 🙂 What do you think? Comment below! I have a been wishing and wishing that the cable companies and the NHL would team up and offer Pay Per View hockey games. 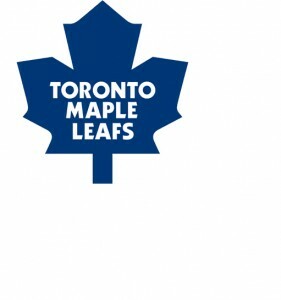 I constantly have to miss Toronto Maple Leafs games because I am in Vancouver and they RARELY ever broadcast them here. I know I can buy NHL Center Ice, but I don’t want to watch ALL the teams and I don’t want to pay that price because I tend to miss many Leafs games just because of the time zone. They should really offer NHL hockey games on a Pay Per View basis. They have football and UFC buy why not hockey??? Its just not fair 🙁 Then they can charge like $10 a game and I’d buy so many games and I’m sure many other hockey fans would. What do you think about that? Leave your comments below. Toronto Maple Leafs fans in the Toronto-area can now show their support by scarfing down Toronto Maple Leaf themed doughnuts!! The doughnuts are available at 320 Tim Horton’s locations around the Toronto-area. 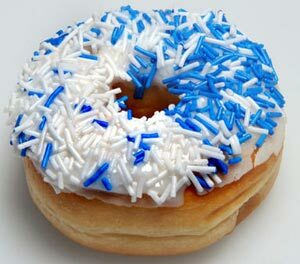 The doughnuts are vanilla-dipped and covered in blue and white sprinkles whenever the Leafs play a home game. I’m not sure how doughnuts are going to help the Toronto Maple Leafs win any games but I guess it’s worth a try right? How much more badly could they play? I want to get my hands on one of those doughnuts, but that won’t be happening anytime soon since I live in Vancouver. I guess I’ll just have to go buy a vanilla-dipped donut and put my own blue and white sprinkles on it. Mmmm doughnuts. I wonder what Homer Simpson would think of these doughnuts? So I attended the Toronto Maple Leafs game on Saturday, December 18th in Vancouver with my best friend. The Leafs were playing against the Vancouver Canucks (obviously.) I proudly wore my Beauchemin #22 jersey to the Sharks Club before and to the game. I cheered my heart out, and voice (I lost my voice) for the Leafs, but they ended up loosing 4 to 1. It is an amazing experience to go to a Toronto Maple Leafs game in Vancouver because the stadium is packed and the fans are even for both teams, if not more for Toronto. The Vancouver Canucks fan are really mean to Leafs fans, they really hate Toronto. I’m not sure why, never will, but that’s the first thing I learned when I moved to Vancouver. I wish the Leafs came to Vancouver more often, but its only every few years since they switched the schedule a few years back. I would pay any price I have to in order to get to a Leafs game in Vancouver. This time my ticket only cost me $189 and I was 25 rows behind the net. Last time I went in 2008 (that’s the last time the Leafs were in Vancouver) I paid $200 for the very last row in the arena. I lucked out this year because I got in on the presale and I didn’t have to buy from someone on Craigslist. I got a free Leafs hat from the fan beside me because he gave up on the Leafs. I would NEVER do that. haha. 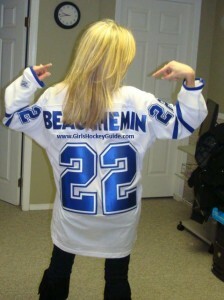 Even though the Leafs lost the game I still walked out of the arena with Beauchemin #22 on my back proud to be a fan! GO LEAFS GO! By the way, I have the Beauchemin jersey just because we have the same last name and my brother plays in the Junior B, and they both wear #22. He is not my necessarily favorite player hehe.